Mix together beans, sausage, celery, bell peppers, red onion, garlic, taco seasoning, salt and pepper and 6 cups water in a 5-quart crockpot. Cover and cook on high heat for 6 hours, or until beans are fork-tender. Top cooked rice with red bean mixture. Garnish with hot sauce if desired and serve warm. In my college (and even early adult) years, when my bank account was less than stellar, I was guilty of eating a steady rotation of instant oatmeal, macaroni and cheese from a box…and a lot of beans and rice. Though it had a teensy bit of carb overload, my diet was more boring than a lecture on 17th century Baroque art (nothing against historical art lovers out there, of course!). Thankfully my weekly rotation of meals has matured quite a bit, but that doesn’t mean I don’t enjoy having my good old staples every now and then, made with a little extra oomph. 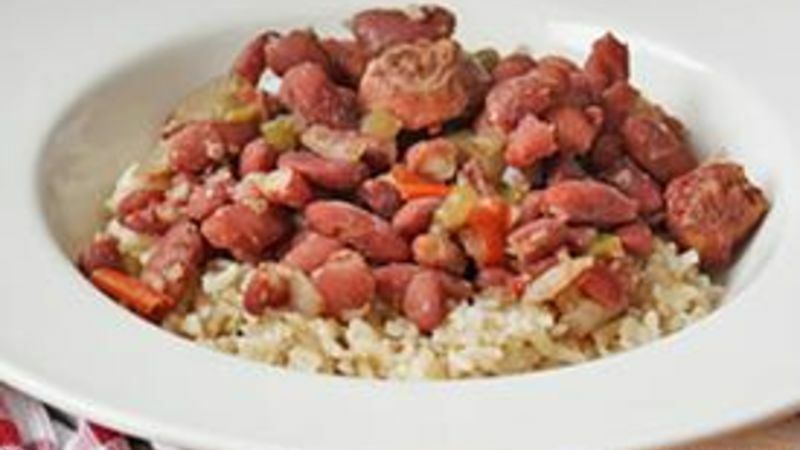 Take this recipe for Slow Cooker Red Beans and Rice, for example. Beans and rice it may be, but boring and bland it is not. And the best part is I can get it ready in the morning, head to the office and when I return, my home is filled with the smell of a delicious, healthy and ready-to-eat dinner. That’s the magic of a slow cooker, I tell you. First, the sausage. I like to use turkey sausage or meatless sausage for my recipe, but any type of sausage link will do. The smoky, hearty flavor of the sausage permeates through the bean mixture while cooking to take the whole dish up a notch. Second, the taco seasoning. I know what you’re thinking: How does taco seasoning fit into a red beans and rice recipe? Let me tell you, whatever magic they put into Old El Paso taco seasoning makes this dish taste that much more delicious, without adding too much sodium or calories. And third, the fresh, chopped vegetables. The green and red bell peppers and sweet red onion contribute a much-needed crunchy texture to the mix. So when you’re in need of an easy, healthy, flavorful and budget-friendly meal to replace your rotation of boring staples (and let’s be honest, who isn’t? ), this is the recipe to try.